Want To Reach 90,000 Readers? Catering to more than 90,000 readers, LSU Alumni Magazine is distributed quarterly with issues published in March, June, September, and December each year. Approximately 15,000 alumni in the Baton Rouge area are recipients, including some 1,500 LSU faculty and staff. LSU Alumni Magazine continues to promote Louisiana State University and the LSU Alumni Association, the latter of which celebrated its centennial in 2005. 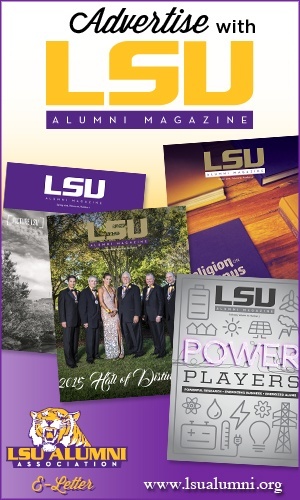 More than 1,500 copies of LSU Alumni Magazine are distributed in doctor's offices in the Baton Rouge, Greater New Orleans and Shreveport areas. The Cook Hotel, located adjacent to the Lod Cook Alumni Center, is owned and operated solely by the LSU Alumni Association. Some 42,500 visitors to the capital city stayed at this top-notch facility in 2015, and guests of the hotel receive a complimentary copy of LSU Alumni Magazine. Copies are also available in The Lod Cook Alumni Center, where more than 15,000 visitors conduct meetings throughout the year. As a quarterly full color periodical, LSU Alumni Magazine enjoys a long shelf life with its readers. That advantage provides multiple viewing opportunities and strong potential for secondary readership. The Association also produces a monthly Alumni E-Letter with stories focusing on alumni across the globe, University news, alumni and chapter events . It targets alums in and out of state as well as LSU seniors and their parents. Ad space is available on the website as well as the newsletter. For more information, contact Mignon Kastanos at 225.578.4529 or by email at mignon@lsualumni.org.